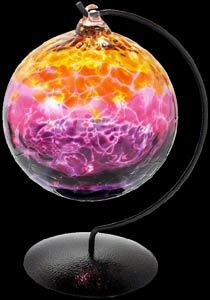 This beautiful skilfully mouthblown glass ball is for that Amazing person in your life. The Amazing Friendship balls are truly amazing! A handmade and unique perfect gift for a totally amazing friend. Display it where you can see its calming and uplifting beauty. Supplied with Metal Stand as shown and Amazing Friendship label.